This post is sponsored by Renew Life®, however, I am sharing my own thoughts. All opinions are my own. Gut health is a big focus in the health industry these days and for very good reason! The gut isn’t just at the literal center of the body; it’s truly is the body’s center when it comes to health and affects so many other parts of our bodies and daily lives. It can affect everything from how you sleep to stress levels and happiness. When balanced and healthy, your gut promotes better digestion and stronger immune health. Literally 70% of our immune system is located in the gut just to put it into perspective. So how do we improve our gut health? A great place to start is by taking a daily probiotic. Probiotics help to restore the balance of flora in the gut. When the flora is unbalanced, it can lead to digestive and other health issues, so taking a daily probiotic helps to balance things out and keep them running and moving smoothly. My go to daily probiotic is Renew Life. Renew Life is a potent probiotic with 3 times more good bacteria than leading brands as well as multiple scientifically studied strains to support digestive balance. These strains specifically reflect the natural diversity of your gut. Renew Life’s targeted release capsules help the probiotics to survive your stomach acid, allowing for more probiotics to actually reach the intestinal tract. Their potent formula contains 12 specifically selected Bifidobacterium and Lactobacillus (often known at the “good bacteria”) strains to help restore digestive balance and support your immune health. They guarantee 30 billion live cultures per each capsule! The Renew Life vegetable capsules are also dairy free and gluten free. There are so many benefits to adding in a daily Renew Life probiotic into your routine. They help to regulate digestion and can aid in avoiding that uncomfortable feeling, which is something that I’m pretty sure we all want to avoid on our summer adventures! They also support your immune health keeping you going for all the fun summer activities. Nobody has time for sick days when you could be swimming in the ocean or hiking that trail you’ve been wanting to try. A daily probiotic can also improve your mood. Did you know that 95% of the body’s serotonin in produced right in the gut? So a happy gut can mean a happy you, literally. Basically your gut affects just about everything important to feeling the healthiest and best that you can! Renew Life offers a variety of products. 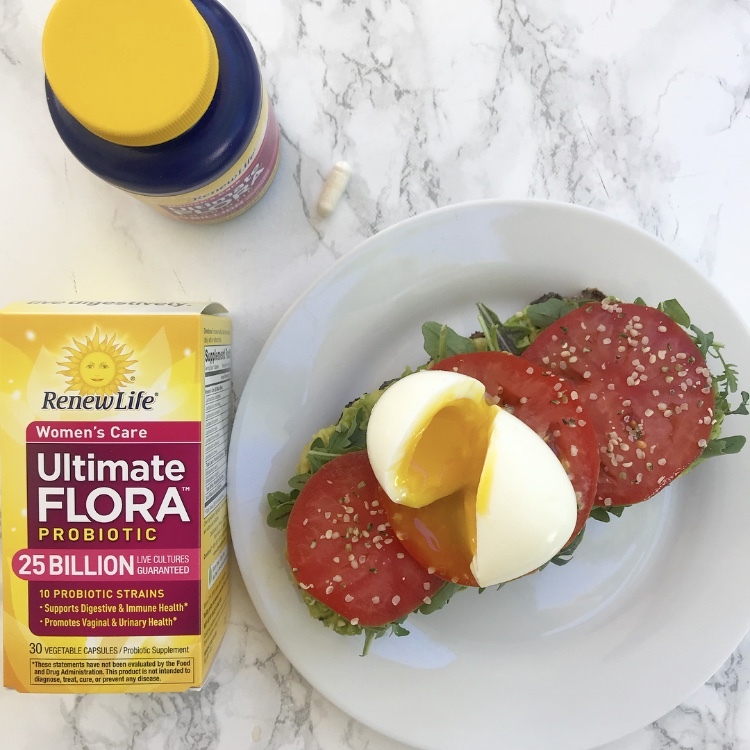 I’ve been taking their Women’s Care Ultimate Flora Probiotic each morning with breakfast and have felt a noticeable difference. They also offer an Extra Care and Kids Probiotic, so they have something for the entire family. You can find out more about Renew Life and their products at: https://www.renewlife.com/extra-care-probiotics.html/. I’d definitely recommend giving them a try for yourself! Let me know what you think or if you have any questions in the comments below!